By 2014 there was no genuine sport and entertainment hall in Krakow. A few years ago authorities decided that it should be built. In 2011 the construction of the hall began and lasted three years. On 30th May 2014 Beethoven Academy Orchestra played the inaugural concert in the new hall. Krakow Arena is the largest in Poland and one of the most modern sports and entertainment hall in the world. Multifunctional hall has 15 thousand seats and its total capacity is nearly 20 thousand people. Three levels of seating or standing audience and the possibility of configuring the audience enable organization of prestigious events. The structure consists of two halls – a large and training hall. The main hall is above all a great arena. Facilities for athletes and artists, enhanced multimedia systems, as well as good acoustic conditions of the object has already convinced many people to perform here concerts and play sports tournaments. It’s hard not to notice the object from a distance, as permanently inscribed on the panorama of Krakow. It is located just 4 km from the Market Square. A unique facade is composed of a glowing LEDs screen. 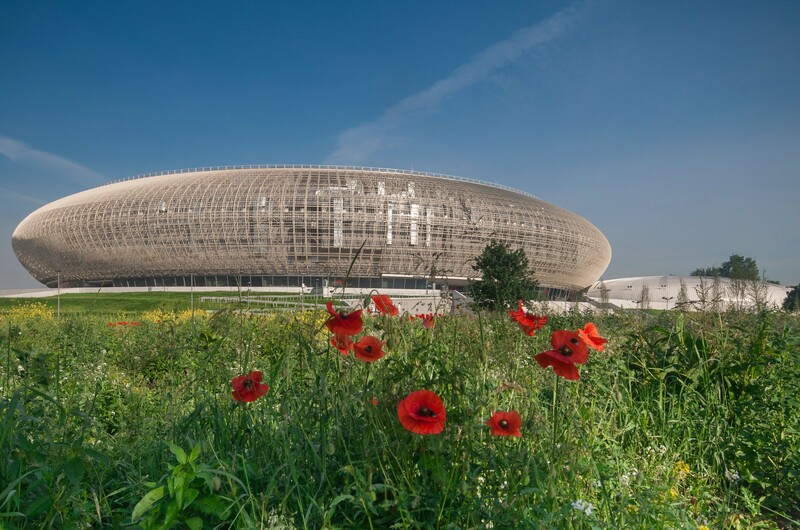 The multifunctional character of the building allows to stage on its premises at least some dozen disciplines in rank of the world championships, for example: volleyball, basketball, athletics, combat sports and tennis. It is possible to use here the most up-to-date theatrical and multimedia systems. Arena is controlled by modern management systems that allows to manipulate the temperature and humidity inside. This certainly meets the expectations organizers of many events and spectators. Krakow Arena is a great place for concerts, sporting events, exhibitions, shows and trade fairs. Thanks to it tourism certainly will develop more dynamically and the Krakow offer became more interesting.